Growth in rural wages not only indicates economic prosperity of the masses, it is also considered important so as to generate effective demand for goods and services, which is produced by various sectors of the economy. When money becomes available in the hands of rural workers due to government spending on programmes such as Mahatma Gandhi National Rural Employment Guarantee Act (MGNREGA), it generates demand for commodities. The production of commodities generates additional demand for credit, raw material and workers. The wages paid to the newly recruited workers creates further effective demand in the economy for commodities. This process is repeated several times following the initial round of government spending. Thus, an increase in expenditure produces an increase in national income and consumption, which is much greater than what was spent initially and this process is termed as 'multiplier effect' in economics. In short, a rupee of government spending will generate more than a rupee in economic growth. The size of the ‘Keynes-Kahn multiplier’—as the fiscal multiplier is popularly known—depends upon a household's marginal propensity to consume (MPC). Many economists and journalists have recently stated that the growth rate of real wage rates in the countryside has been declining, which indicates deepening of agrarian crisis and rural distress. A contraction of the rural economy is also happening due to the stagnation in real wages. Calculations done by the Inclusive Media for Change team shows that the average daily real wage rates for rural men in agricultural occupations (12 in numbers) grew by -1.76 percent in 2015-16 (viz. year-on-year growth), 1.49 percent in 2016-17, 1.65 percent in 2017-18 and a meagre 0.25 percent in 2018-19 (April-December, 2018). Please consult chart-1(a). The average daily real wage rates for rural men in non-agricultural occupations (13 in numbers) exhibited a growth by 0.12 percent in 2015-16, -0.13 percent in 2016-17, 1.25 percent in 2017-18 and -0.01 percent in 2018-19 (April-December, 2018). The average daily real wage rates for rural men in combined occupations (12 agricultural occupations + 13 non-agricultural occupations) increased by -0.74 percent in 2015-16, 0.58 percent in 2016-17, 1.51 percent in 2017-18 and 0.09 percent in 2018-19 (April-December, 2018). 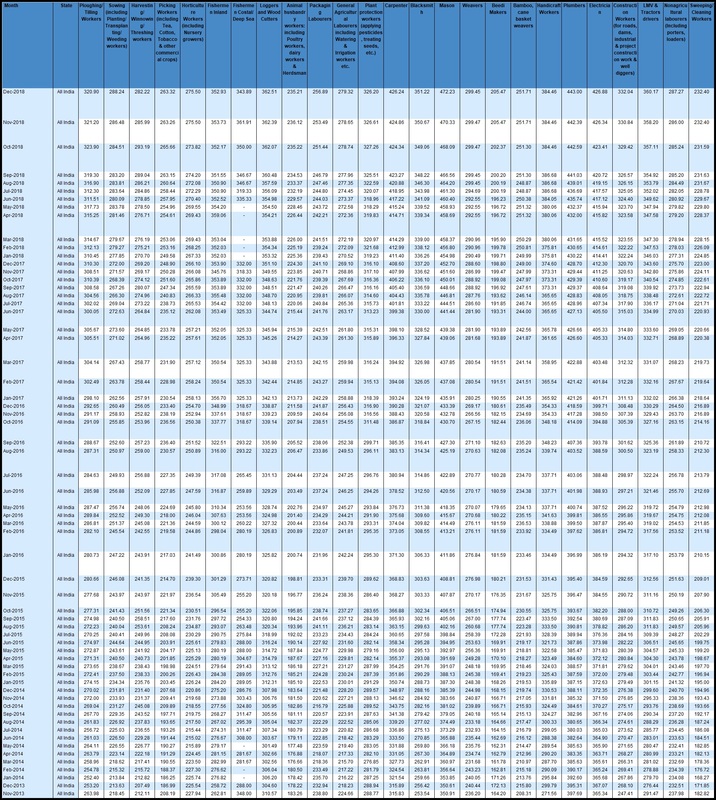 Please check chart-1(a). Note: The 12 agricultural occupations considered for calculating the average daily farm wage rate in a year are Ploughing/ Tilling Workers; Sowing (including Planting/ Transplanting/ Weeding workers); Harvesting/ Winnowing/ Threshing workers; Picking Workers (including Tea, Cotton, Tobacco & other commercial crops); Horticulture Workers (including Nursery growers); Fishermen Inland; Fishermen Costal/ Deep Sea; Loggers and Wood Cutters; Animal husbandry workers: including Poultry workers, dairy workers & Herdsman; Packaging Labourers; General Agricultural Labourers including Watering & Irrigation workers etc. ; and Plant protection workers (applying pesticides, treating seeds, etc.). The 13 non-agricultural occupations considered for calculating the average daily non-farm wage rate in a year are Carpenter; Blacksmith; Mason; Weavers; Beedi Makers; Bamboo, cane basket weavers; Handicraft Workers; Plumbers; Electrician; Construction Workers (for roads, dams, industrial & project construction work & well diggers); LMV & Tractors drivers; Non-agricultural labourers (including porters, loaders); and Sweeping/ Cleaning Workers. The average daily wage rate in agricultural/ non-agricultural/ combined occupations is the arithmetic mean of the nominal daily wage rate in 12 different farm occupations/ 13 different non-farm occupations/ 25 combined occupations (12 farm occupations + 13 non-farm occupations) in rural areas for men, respectively. The Inclusive Media for Change team has deflated the average daily wage rate in agricultural occupations/ non-agricultural occupations/ combined occupations with the Consumer Price Index of Rural (CPI-Rural, Base Year 2012=100) India so as to get the average daily real wage rates for rural men in a year. The average daily wage rate in a year is the average of daily wage rates during April-March (viz. arithmetic mean of various months, starting from April and ending in March in a financial year). 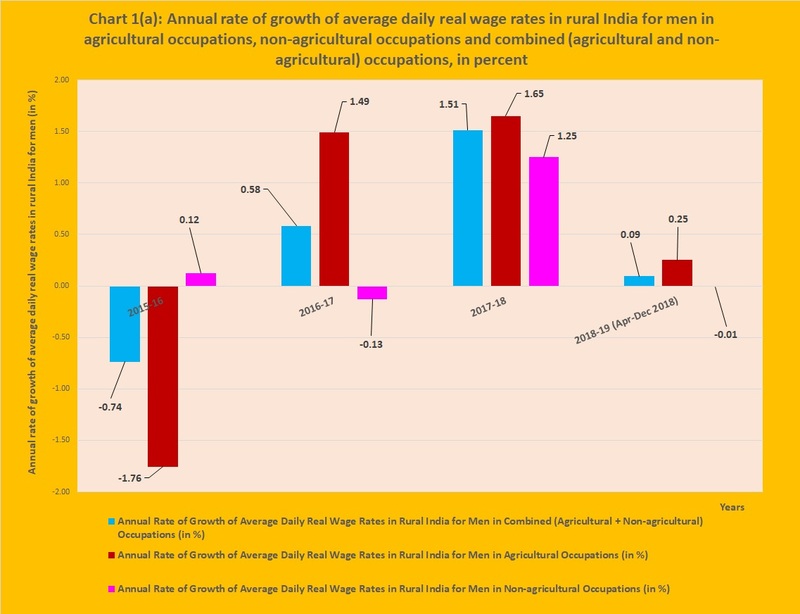 Chart-1(b) depicts that during April-December, 2018, the average daily nominal wage rates in agricultural occupations for rural men grew by 3.3 percent, whereas the average daily nominal wage rates in non-agricultural occupations for rural men went up by 3.04 percent. As a whole, the average daily nominal wage rates in combined occupations (12 farm occupations + 13 non-farm occupations) for rural men rose by 3.14 percent in April-December, 2018, although the average CPI-Rural increased by 3.04 percent in the same period. In 2015-16, the average daily nominal wage rates in farm occupations for rural men jumped by 3.71 percent, whereas the average daily nominal wage rates in non-farm occupations for rural men increased by 5.7 percent. The average daily nominal wage rates in combined occupations for rural men rose by 4.79 percent in 2015-16, although the average CPI-Rural went up by 5.57 percent in that year. 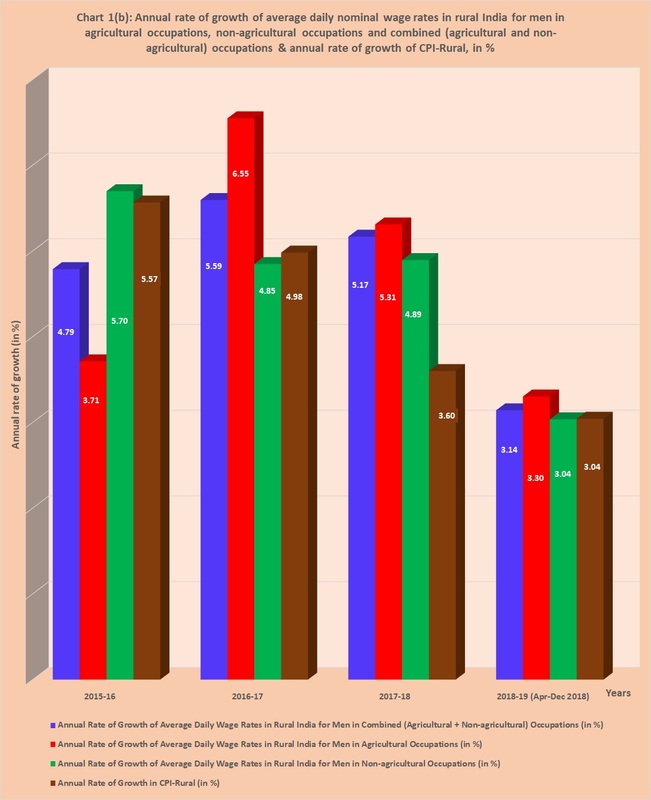 It may be noted by the readers that the Reserve Bank of India (https://rbi.org.in/) has collated and is releasing monthly time series data on rural wage rates based on the data published by the Labour Bureau, Ministry of Labour and Employment. Starting from November 2013 the Labour Bureau (http://labourbureau.nic.in/, http://labourbureaunew.gov.in/) is collecting rural wage data with respect to 12 agricultural and 13 non-agricultural occupations across 20 major states, namely, Andhra Pradesh, Assam, Bihar, Gujarat, Haryana, Himachal Pradesh, Jammu & Kashmir, Karnataka, Kerala, Madhya Pradesh, Maharashtra, Manipur, Meghalaya, Orissa, Punjab, Rajasthan, Tamil Nadu, Tripura, Uttar Pradesh and West Bengal. A note from the RBI's Database on Indian Economy explains that the average wage rates at the national level have been derived by dividing the sum total of wages of all the 20 states by the number of quotations. Please click here to know more about the wage rates of rural men in various agricultural and non-agricultural jobs. Since there is no distinct trend in annual growth of real wage rates for agricultural, non-agricultural and combined occupations during the last 4 years, an attempt has been made to see the trends in monthly growth of real wage rates for rural men. From the interactive chart-2(a) it is quite clear that the monthly rate of growth of real wage rate (on a Year-on-Year basis) of rural men in agricultural occupations fell from the peak level of 5.9 percent in May, 2017 to -3.37 percent in January, 2018. The monthly rate of growth of real wage rate (on a Y-o-Y basis) of rural men in agricultural occupations was -1.19 percent in November 2017, -1.48 percent in December 2017, -3.37 percent in January 2018, -2.10 percent in February 2018, -2.07 percent in March 2018, -2.54 percent in April 2018, -2.64 percent in May 2018, -1.45 percent in June 2018 and -1.59 percent in July 2018. The real wage rate of rural men in farm occupations grew (on a Y-o-Y basis) by 2.31 percent in December, 2018. The monthly rate of growth of real wage rate (on a Y-o-Y basis) of rural men in non-agricultural occupations fell from the zenith of 3.83 percent in June, 2017 to -1.52 percent in January, 2018. The monthly rate of growth of real wage rate (on a Y-o-Y basis) of rural men in non-farm occupations was -0.04 percent in November 2017, -0.61 percent in December 2017, -1.52 percent in January 2018, -0.76 percent in February 2018, -0.50 percent in March 2018, -1.06 percent in April 2018, -1.40 percent in May 2018, -1.32 percent in June 2018 and -0.71 percent in July 2018. The monthly rate of growth of real wage rate (on a Y-o-Y basis) of rural men in non-farm occupations was 2.15 percent in December, 2018. The monthly rate of growth of real wage rate (on a Y-on-Y basis) of rural men in combined occupations (12 farm occupations + 13 non-farm occupations) was 2.22 percent in December, 2018. Please see chart-2(a). Chart-2(b) depicts that in December, 2018, the average daily nominal wage rates in farm occupations for rural men grew by 3.85 percent, whereas the average daily nominal wage rates in non-farm occupations for rural men increased by 3.69 percent. The average daily nominal wage rates in combined occupations (12 farm occupations + 13 non-farm occupations) for rural men grew by 3.76 percent in December, 2018, although the average CPI-Rural jumped by 1.5 percent in that month. In November, 2014, the average daily nominal wage rates in farm occupations for rural men grew by -0.66 percent, whereas the average daily nominal wage rates in non-farm occupations for rural men increased by 5.97 percent. The average daily nominal wage rates in combined occupations for rural men rose by 2.93 percent in November, 2014, although the average CPI-Rural went up by 3.15 percent in that month.